EVs coming soon – are they worth waiting for? Electric cars are increasing in popularity as UK buyers switch on to the benefits of plug-in cars. In 2018, around 60,000 Electric Vehicles (EVs) and Plug-in Hybrid Electric Vehicles (PHEVs) were sold, and that number is set to grow rapidly. Here's the Parkers guide to how EVs work, which ones to buy now. First, it's worth explaining what an electric car is. There are various types of plug-in motors out there, but this guide concentrates on those that are powered entirely by electricity with no need for petrol or diesel propulsion. An electric car is one that relies on batteries to store charge. These are known as Electric Vehicles or EVs. More manufacturers are offering electric cars and vans, and their number is increasing rapidly – with the large premium manufacturers about to flood the market with models offering more range and usability than ever before. Tesla's been there for years, Jaguar joined the party with the I-Pace in 2018, and Audi, BMW and Mercedes-Benz have new family-sized offerings in the pipeline. Which electric cars can I buy now in the UK? Can buying an electric car save you money? Yes. For those in cities, an EV's most undeniable advantage is that they produce no CO2 emissions while they're being driven, meaning there’s no London Congestion Charge or VED car tax (providing they cost less than £40,000 when new) to pay. There's also a financial contribution from the government, known as the Plug-in Car Grant (PiCG). Until 21 October 2018 this was worth £4,500, but since that date it's been reduced to £3,500. But in terms of purchase or finance costs, definitely not. Most EVs cost more to buy outright than their petrol equivalents (if they have one), and the difference in PCP finance monthly costs can be quite stark, too. Higher finance costs are usually down to higher cash prices, restricted supplies of EVs and also their (typically) lower resale values. Undoubtedly, the most cost-effective way into an EV for most private buyers to to pick up a used one. If you have a garage or off-road wall-space where you can have a chargepoint fitted, you'll enjoy the most convenient EV experience. Companies such as Pod Point will supply a unit for £779-£1,499 (£279-£999 with OLEV grant), and for that, you'll get between 3.6kWh (1.6x faster than domestic three-pin plug) and 22kWh (10x faster than a three-pin plug). Some manufacturers offer free or discounted wallboxes, too. 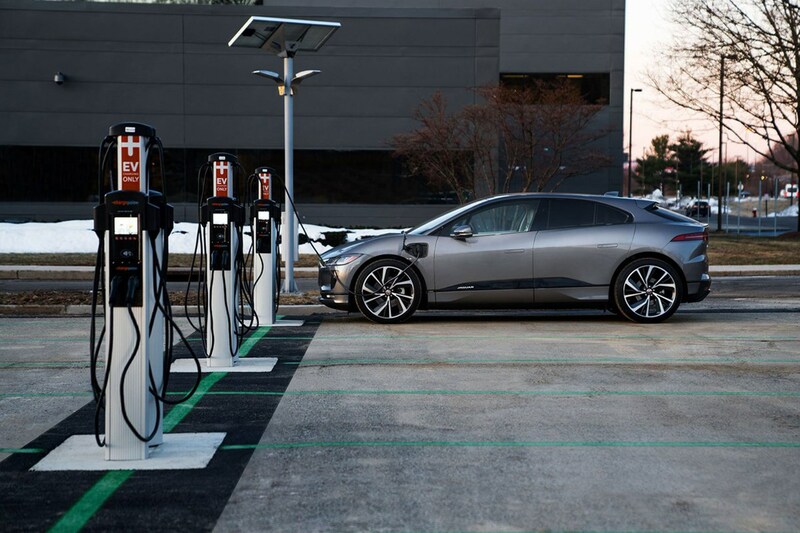 These are similar to the electric car fast charging stations you’ll find in public car parks, supermarkets and motorway services, although rapid chargers will offer even quicker charging. Finding public fast and rapid chargers is easy, too, thanks to a number of sophisticated smartphone apps such as Zap Map, which not only help you locate and navigate to them, but also advise whether they're functioning or in use. As there are several network providers, be aware that you'll need a number of charging accounts if you liberally use public chargepoints. Most EVs have smart satnavs built in, too, that will help you find chargepoints when planning longer journeys. How do the batteries in an EV compare to petrol? A small car like the Smart Forfour Electric Drive has a 17.6kWh battery pack, meaning that a drain of 17.6kW will deplete the pack in an hour. Fully draining a battery is bad, however, and in all cases a reserve of capacity will be maintained to protect the cells. At the other end of the scale, Tesla’s Model S has a minimum of 75kWh, with an option for 100kWh. On the subject of scales, the 2017 Smart Forfour tips them at 1,200kg, in Electric Drive form. That’s an increase of 225kg over the petrol equivalent. The Tesla Model S battery pack weighs 540kg. For comparison filling up the 975kg Smart Forfour petrol’s 35-litre petrol tank adds just 26kg to the weight, and it gets lighter as range is used up. Yet it provides almost 350kWh of potential energy. Buying an electric car: are they reliable? For the most part, yes. Batteries themselves have proven remarkably robust – early Nissan Leafs and hybrid Toyota Pruises are driving around with 500,000 miles on them in some parts of the world, still on their original batteries. There are side effects to the electric drivetrain, too. Capable of 20,000 to 40,000 hours of operation before failure, the motors themselves should outlast the bodies and there’s no clutch or gearbox to wear out. Using the motor as a generator to brake and recharge the batteries also ensures wear on the brake pads is minimal, and a set of brakes can last considerably longer than regular hydraulic systems. But aside from these consumables, DIY work (at the moment) on EVs isn't as accessible as more conventional cars, although you can expect this situation to change as the technology (and understanding of it) becomes more widespread. What are the pros and cons of an electric car? If you compare the cost of running – not buying or leasing – an EV to that of running a conventional or hybrid car you'll see that thanks to Government backing of electrically powered transport, your running costs are going to be very low. As well as costing only a few quid to charge overnight, there's the 100% discount on VED road tax and Congestion Charge. Typically 1,000 miles of EV driving costs about £100. You'll enjoy ample pulling power and lovely hair-trigger acceleration. There's no waiting for the car to get to a certain engine speed before the fun starts - you just prod the throttle and you're off. Refinement is also better than petrol or diesel thanks to near-silent propulsion. You'll be able to rest safe in the knowledge that you're doing your bit to cut tailpipe CO2 emissions, thus helping the environment in your immediate area. We'll not raise the issue of secondary pollution in terms of where the electricity to charge electric cars comes from here. This really is a thing, even if it's probably less of a factor for most people than you might think. According to a recent electric vehicle ownership survey, most (77%) journeys last less than 20 miles, while just 2% of drivers used more than 50% of the battery. But having a car with a limited range still bothers most people. Electric cars are typically still more expensive in cash, PCP and leasing terms. That's an undeniable truth that will remain with us for some time yet. The residual values for electric vehicles are not very strong, so if you buy outright then you'll suffer heavy depreciation. This also affects a fleet manager's decision on whether to introduce EVs onto the fleet. This will change in the coming years as EVs become more accepted, but for now, if you're buying used, you're definitely in the pound seats. 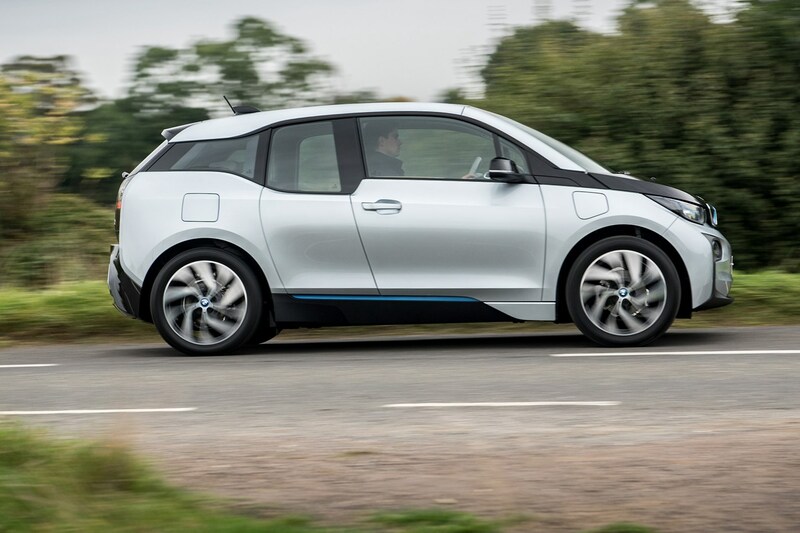 The BMW i3 is the groundbreaking small electric car that spearheaded the German company’s launch in the EV arena. It’s a compact but pricey, so although it's much smaller than a Nissan Leaf or Volkswagen e-Golf, it's suffused with more premium polish than either. In autumn 2017, BMW added a new, sportier i3S model, which costs another £3,000 again. It too was available as a pure EV or with the range-extender optio, which used a petrol generator to increase your range per charge. By March 2018 BMW had sold 10,000 i3 hatchbacks in the UK alone, with 2017 being its best-selling year to date, indicating the growing popularity of electric cars. Here's the current EV poster boy. The luxury car world is changing, and Jaguar has embraced the electric vehicle challenge with this bespoke new car – and in doing so, has beaten its German premium rivals to market with a viable challenger to Tesla's dominance of the premium electric car market. 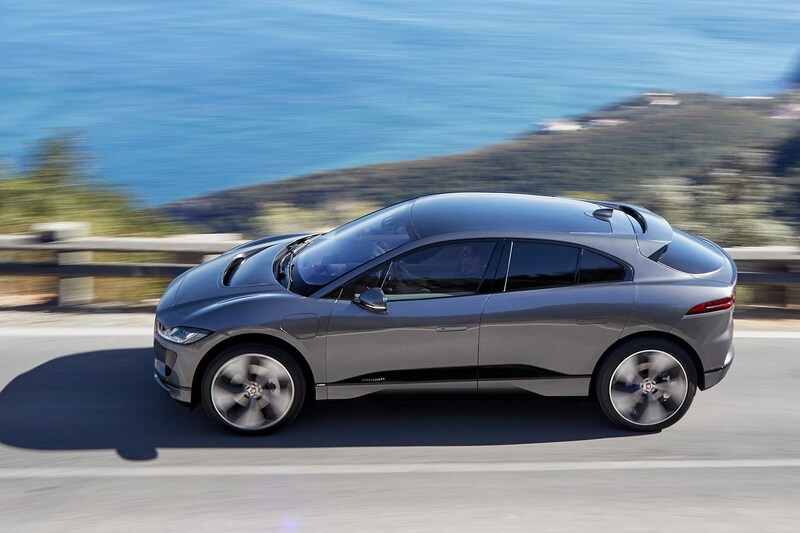 The I-Pace is a gamechanger for Jaguar – and for the car market generally. As such, it currently has no direct rivals, as the Tesla Model X and S are both significantly larger. That will change in 2019 once the Audi E-Tron and Mercedes-Benz EQ C hit the market. This Soul EV is about to be replaced by an all-new third-generation model during 2019, with the new Soul only be sold in the UK in electric form. That doesn't mean you should overlook the outgoing model, though. There’s less boot space and rear legroom than in the regular Kia Soul as the batteries are housed at the back - it's a compromise as the Mk2 Soul wasn't designed from the outset to be an EV. They provide a reasonable 132-mile range - indicating how far battery technology has moved-on since the Soul's launch - but will take over 10 hours to recharge on a normal domestic mains set-up. The Kia Soul EV is a doddle to drive smoothly, making especially light work of the trudge of urban driving. Once again braking energy is recovered and stored as electricity in the battery pack. 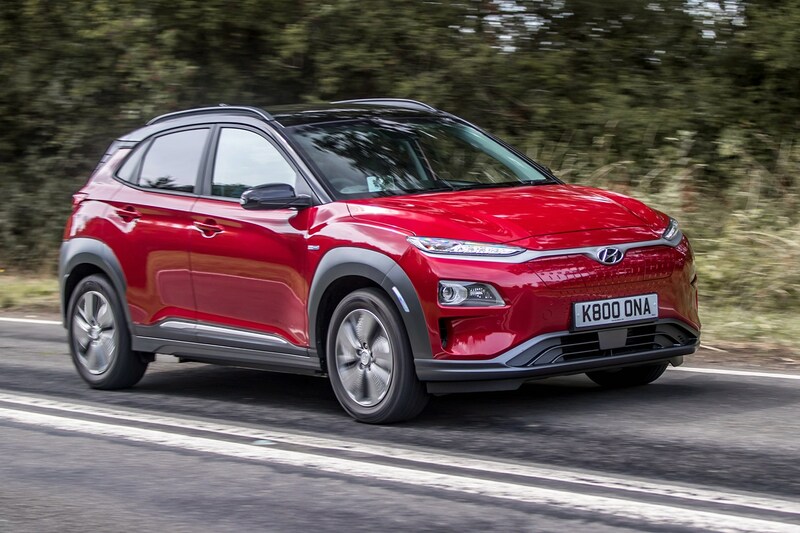 The Hyundai Kona Electric might look like its petrol and diesel-powered siblings, but it's pretty much the gamechanging EV in its market sector. It's similar-looking inside and out, with a smoother nose and re-profiled bumpers, while the dashboard has been altered to accomodate a high-set centre console, but where the Kona scores so well is in how much range and performance it offers. There are two different power and battery capacity versions of the Kona Electric. Entry point is the 39kWh battery with a 136hp electric motor, with a claimed range of up to 194 miles. More headline-grabbing is the 64kWh Kona Electric paired with a 204hp electric motor – here the claimed range is 300 miles. We rated it highly enough to give it our Best Eco Car award in the 2019 Parkers New Car Awards. Sharing its underpinnings with the Kia Niro, the Ioniq bears more than a passing resemblance to the Toyota Prius, but unlike its Japanese rival, the Hyundai is available in self-charging hybrid, plug-in hybrid (PHEV) and fully electric forms. While the driving experience won't thrill enthusiasts, it handles neatly and progress on the electric version is deftly smooth courtesy of its 120hp/295Nm motor. It's longer than its direct rivals - the e-Golf and Leaf - ensuring that cabin space isn't compromised by the battery packs nestled under the seats, while boot space is reasonable at 350 litres. Plus, being a Hyundai, it has a bulletproof reliability record reinforced by the brand's five-year warranty. Nissan introduced the Mk2 Leaf in 2018, but don't be fooled into thinking it's an all-new car - it isn't. Instead, it's a very clever re-skin and overhaul of the original, with a sharper-suited body and a normalised cabin. Plus, the motor and battery combination has been improved giving peppier performance and a genuine 150-mile range in summer months - something we've experienced with our long-term test Leaf. Its primary drawback is that because the 40kWh battery lacks a sophisticated cooling package it can only be rapid-charged once every 24 hours - something remedied with the more powerful, longer-range Leaf about to hit showrooms in 2019. It's less accomplished as a driver's car than the Hyundai Ioniq, let alone the Volkswagen e-Golf, but seeing as it goes further than both between charges, it's still an enticing package. All is not quite as it seems with the Peugeot Ion and very closely-related Citroen C-Zero cousin, principally because they are not really PSA cars at all – they are both rebadged versions of the Mitsubishi i-MiEV - a model long-since discontinued. Compared with newer electric cars, it’s clear to see how technology has moved on with a range of just 93 miles claimed by Peugeot, although it’ll only take seven hours to fully recharge its modest battery pack. There’s space inside the Ion for four, but the narrow bodywork makes it a tad cosy as well as making it feel less stable to drive than the more polished Renault Zoe (below). Forget the not-really-suitable-for-Britain Twizy two-seater and the Renault Zoe is the cheapest four-seat electric car you can buy in Britain. That attractive price masks one key factor with the Zoe – there's a choice of leasing the battery or purchasing the car and battery, with prices ranging from £49 to £110 per month depending on the length of the agreement and annual mileage. Sweetening the deal is the inclusion of a faster-charging domestic wallbox that could reduce a full recharge to just three hours. Clever on-board technology also recuperates energy when slowing or braking, storing it in the battery pack, which could give up to 130 miles of driving. The Zoe is a spacious and safe five-door hatchback, boasting a five-star Euro NCAP crash rating, with lots of eye-catching detailing. 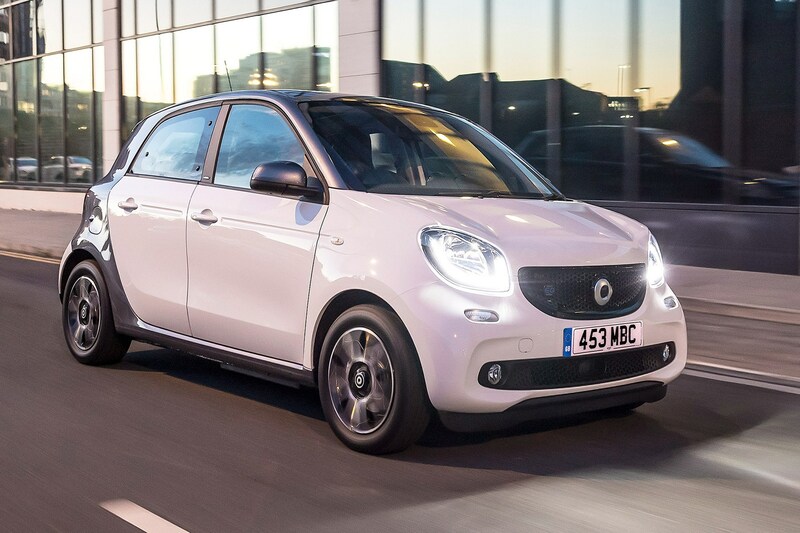 If you're looking for the cheapest electric car, then look no further than the Smart Fortwo EQ Coupe. EQ took over from Electric Drive in 2018 as the EV sub-brand for both Smart and for Mercedes-Benz. This change also ushered in improvements to both the driveability of the electrically powered Fortwo as well as extending its range, but the pert two-seater's city-centric short length and tiny 6.95m turning circle remain intact. We prefer the electric iteration over the petrol engines, as the 82hp and 160Nm of torque are available from a standstill, meaning this little car is extremely nippy around city roads and away from traffic lights, aided by its single-speed gearbox. Smart claims you can get 99 miles between charges, which doesn't sound much, but it will last well if the car's primarily used around town. A depleted battery will need around six hours to charge to 80% from a normal domestic socket, or in less than 40 minutes from a professionally installed wallbox. The Smart Forfour impresses as a city car because of its diminutive size and laughably small turning circle. It makes light work of parking spaces that are designed to accommodate larger cars, and it’s entertaining, well equipped and decent value for money. Going electric in a Smart is one of the cheapest options on the market with four seats, and in the right scenario, a surprisingly stress-free ownership experience. It could be the perfect solution for city dwellers with access to renewable energy – and affordable hire cars for longer trips. 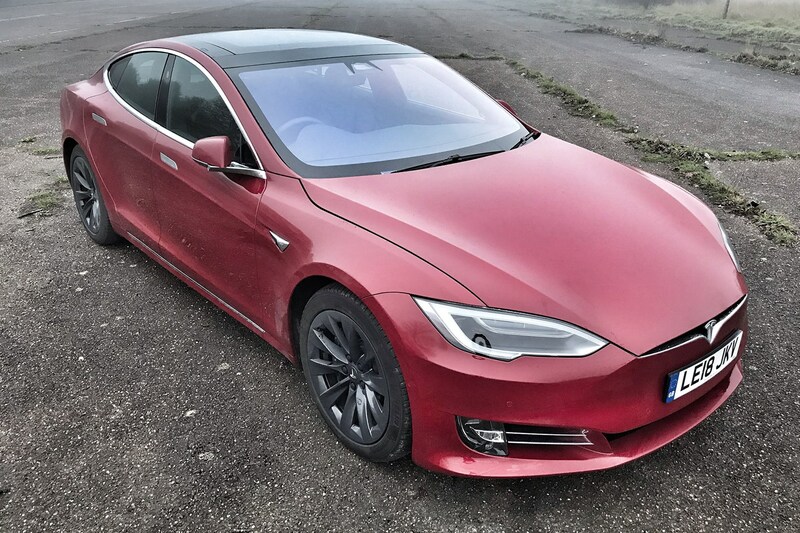 Years after its launch and the Tesla Model S still offers plenty of wow factor, and represents the peak of the EV ownership experence right now. It offers incredible comfort and a virtually silent cabin as well as masses of performance and road presence. Thanks to the undeniable benefits of Tesla's bespoke Supercharger network, and concierge-style ownership experience, it still feels more special than all its rivals, despite sometimes-flaky interior quality. This is a real contender, and has been largely responsible for consumers warming to the idea of an electric vehicle with so few compromises. 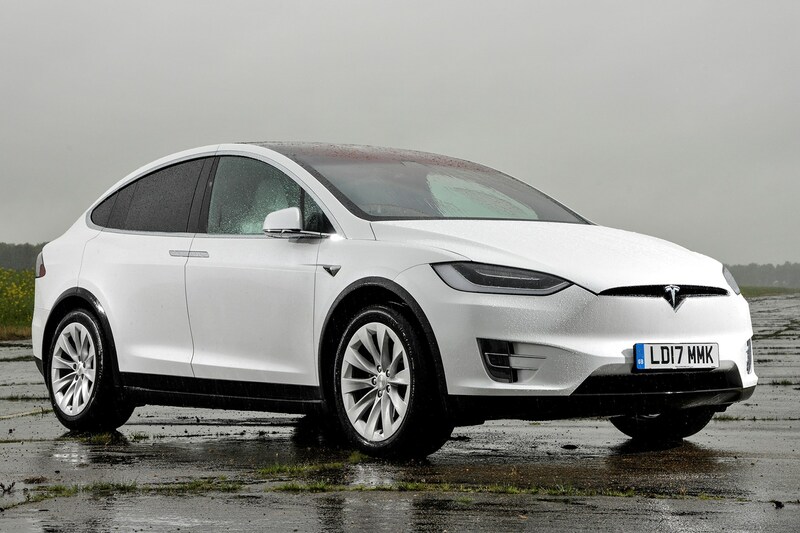 Despite being less of a visual treat than the Model S, the Tesla Model X is still a highly impressive vehicle. It's comfortable, cossetting and swift, and offers the novelty of those weird Falcon Doors that open upwards at the rear. But certain quality and refinement issues mean that it doesn't always attain the standard expected of vehicles costing a fraction of the Model X’s price. The Model X’s all-electric powertrain, optional semi-autonomous capabilities and a connected multimedia system that can be updated to the latest version over-the-air puts Tesla at the forefront of automotive innovation. Unlike the Zoe and Leaf, the e-Up is an electric version of the otherwise petrol-powered Volkswagen Up city car rather than a purpose-designed EV. Available only with the more practical five-door body, the four-seater e-Up’s batteries are housed low down within the VW’s underpinnings ensuring that ride and handling remain positive attributes. Energy recovery ensures the batteries capture electricity which would otherwise be wasted to be used to re-power the car. Visual differences from the regular Up are minimal and limited to LED day running lights in the front bumper and EV-specific instrumentation. It's on the pricey side but batteries are included as part of the package, unlike the cheapest versions of the Renault Zoe. Despite being on the brink of being replaced by an all-new generation of models, the Volkswagen Golf remains the mid-sized family hatchback of choice, particularly if you want a petrol- or diesel-engined version. For the electric e-Golf, it's less clear cut. 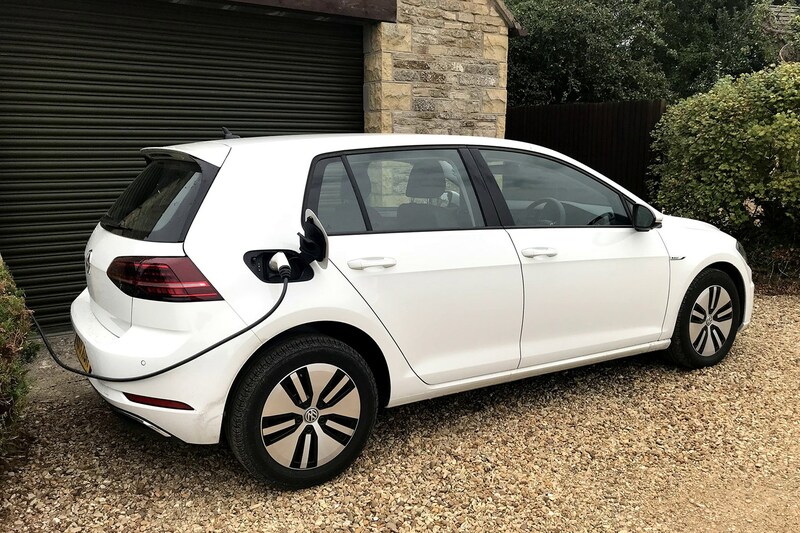 On one hand you have the excellent driving manners and plush-feeling cabin common to all Golfs, but with a quoted range of just 124 miles under the latest, more realistic WLTP testing regime. Driving with vigour also limits its ability to travel far between recharges. 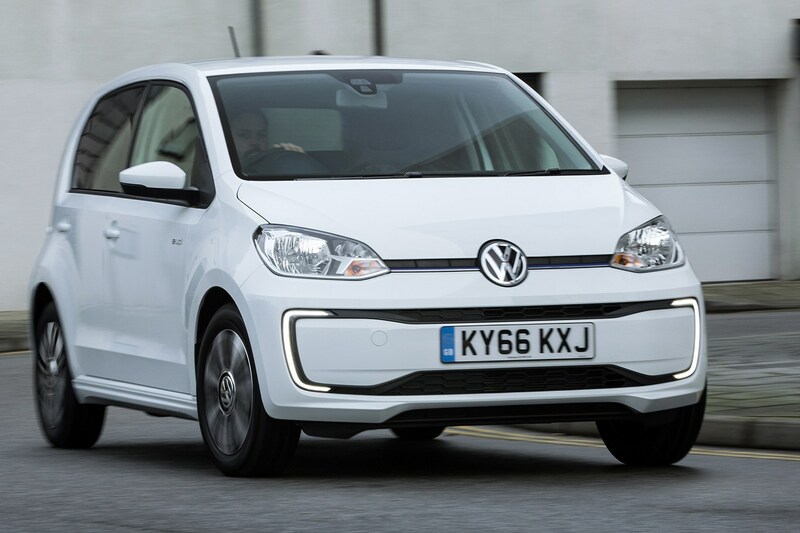 If you're primarily driving the Golf on shorter, more city-centric journeys, with easy access to charging facilities, then the range is less likely to be an issue, making the e-Golf a sound choice. However, also be aware that when that all-new Golf arrives towards the end of 2019 the electric version will be replaced by an entirely new range known as the I.D. Neo. Which electric cars are coming soon?